Did you know that wisdom teeth are the last teeth to emerge, generally between the ages of 17 and 25? Commonly known as third molars, for some people they erupt without any problems, but for others they can create a range of oral and general health concerns. A common wisdom teeth problem is when they become impacted, having developed at an angle and becoming trapped either against other teeth or below your gum line. Not all impacted wisdom teeth will cause pain and alert you to a developing problem, which is why you should attend regular oral health checks to allow us to detect when something has gone wrong. Because impacted wisdom teeth are difficult to properly clean with your regular brushing, bits of food and bacteria can easily become trapped here, causing a condition called pericoronitis. Though this problem can be eased with regular use of mouthwashes and sometimes antibiotics, if they regularly cause you problems, having your wisdom teeth extracted may be the best treatment for you. It is estimated that over 80% of wisdom teeth will need to be removed. And because it is not possible to predict if or when your wisdom teeth may cause you a problem, we recommend removal earlier rather than later. 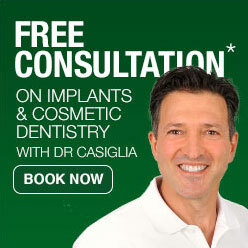 We can remove many wisdom teeth under local anaesthetic at our Apple Dental Lane Cove practice. For unusual cases, we may refer you to an oral surgeon who can extract your wisdom teeth in hospital under general anaesthetic. We are only too happy to discuss all the available options with you. Before your wisdom teeth treatment begins, it is crucial that you let us know whether you’re taking any prescription or over-the-counter medication. You must also be sure to alert us if you have any other general health problems, or if you’re allergic to any medications. Your recovery will generally take a few days. You may experience some slight post-operative swelling. Over the counter pain relief medication is often all that is required to relieve any discomfort. We recommend you follow a soft food diet for a few days. Your wisdom teeth, or third molars, are a set of (usually) four teeth that erupt into the back corners of your mouth, usually at around the ages of 17 to 21. Not everyone has wisdom teeth, and some people are naturally missing one or more of their wisdom teeth. Impaction means your wisdom teeth will not grow or erupt into a position that allows them to be functional teeth. Because teeth that become impacted are generally more likely to cause problems, the Apple Dental team may advise you that your wisdom teeth need to be removed. How can I ease the pain of impacted wisdom teeth? To alleviate your gum soreness and inflammation, try rinsing your mouth out with salt water (made using warm water and a teaspoon of salt) twice a day. This mouthwash can sometimes help by soothing the areas your toothbrush cannot reach. Are impacted wisdom teeth really that bad? Impacted teeth can easily cause infections of the gum around the teeth, decay and resorption of adjacent functioning teeth, and gum disease around the molar teeth. Rare complications such as cysts and tumours can also develop around impacted teeth. Infections are by far the most common problem, and in a small number of cases, can cause severe or life threatening complications. Although infection can respond to antibiotics, the only real way to treat it is to remove the source of the problem – your wisdom teeth. Should I wait until my wisdom teeth cause me problems? Impacted wisdom teeth can cause damage without any warning. It’s also important to consider that as you get older, you will recover from surgery more slowly, which means your wisdom teeth will generally be more difficult to remove the older you are. Does everyone need to have their wisdom teeth extracted? No – if you have sufficient room in your jaw, your wisdom teeth can erupt in the correct position and function correctly, or they may remain unerupted and cause no problems. But for most people, this is usually not the case. Have more questions about wisdom teeth treatment? You can visit us at 1 Finlayson St, Lane Cove NSW 2066; or call us on (02) 9420 5050.